Our Life Mastery Teacher Programs are powerful Sacred Heart awakenings - an opportunity to let go of the heaviness in your life, emerge lighter, fresher, fuller and more aligned with Soulfull presence. Life Mastery, is about bridging your physical-emotional-mental-spiritual experiences of the world. About bringing more Light & Soul into your body, your work, your finances, your relationships & community. And at the Heart of Life Mastery is the practice of grounded spirituality, a presence that is practical, authentic, service orientated & overflowing with joy. Essentially, Life Mastery is your guide, companion & best friend in supporting you to flourish into the person you feel & know yourself to be in your Heart. You can study our Life Mastery Programs through our Heart Retreat Programs, or as detailed on this page you can complete your entire studies online and graduate as an Internationally Accredited Master Teacher. Whilst our Life Mastery Programs are Teacher Programs, there is no obligation to teach any of our workshops AND in fact MANY students complete our Life Mastery Programs purely for the joy of learning, mindful living, and connecting with a deep sense of inner-peace & sacred purpose. We offer three online study Life Mastery Programs through our Wisdom School - one for each of our Schools three Wisdom Modalities. You can enrol in any of our Programs at any time PLUS you can take a long as you like to complete your studies. And even better... you get a lifetime of access of your all our Courses & Resources! Whilst our three Life Mastery Programs are all studied online, all three programs incorporate one-on-one mentorship time with Simone during your studies to help you navigate your studies & embrace a deep resonance with the wisdoms. PLUS you receive a very comprehensive online Teacher Graduate package to support & flourish your success in teaching / future endeavors. The three boxes below give you a high-level overview of each of our three Life Mastery Programs... and then keep ready down the page for a deeper insight.  Full Access Graduate Resources, Directory Listing & Event Promo. Crystal Light Healing® is a transformational, reverently ancient & miraculously futuristic healing modality. The cherished wisdoms at the HEART of Crystal Light Healing® contain timeless truths about our creation story. This ancient knowledge has then been unravelled and woven together to create a body of work that is easy to understand and so refreshingly straightforward to apply in every area of your life. Our Crystal Light Healing® Internationally Accredited Teacher Course taps into the richness of Sacred Ancient Crystalline Wisdom whilst inter-weaving leading-edge scientific discoveries that give credence to the why / how / what of Crystal Healing. Your Crystal Light Healing® studies with us are Heart based teachings, drawn from an infinite well of Universal LOVE. PLUS they are practical, grounded & radiantly fun! Inviting you to study Crystal Light Healing® Teacher Program with us and join our community of 1000's of graduates around Ancient Mamma Earth sharing their Crystal Healing wisdoms in many creative, innovative and fabulistic ways! When you enrol in our Life Mastery Crystal Light Healing® Master Teacher Program, you receive instant access to our Crystal Light Healing® Master Teacher eCourse WEB PORTAL, such that you can start your online studies immediately! Please view our Crystal Light Healing® Practitioner eCourse page for full details. Please view our Crystal Light Healing® Sacred Ancient Wisdom eCourse page for full details. Please view our Shealla-Dreaming eCourse page for full details. Please view our Soul Evolution eCourse page for full details. eMarketing your Spiritual Business for Teachers eCourse - 10 part online video series that supports Teachers in flourishing their online presence. This comprehensive course covers everything you need to know from setting up a website, basic SEO (Search Engine Optimisation), if you already have a website then getting it seen, Email Databases/Marketing, Cloud Storage, Graphics/Stock Images (how to create your own images), Social Media, Webinars & eProducts. 6. 4 x Personal Mentor Sessions with Simone. These Personal Mentor Sessions (via Zoom) with Simone are driven by YOU. For-instance you could focus on gaining clarity of your current circumstances, letting go of blocks that are inhibiting your success, or even focus on the integration of Crystal Light Healing® with your other modalities. The aim is to give you one-on-one time with Simone to support your studies & help you to flourish in all areas of your life. Crystal Light Healing® is an Interationally Accredited Modality with the IICT, hence upon being awarded your Certificates, you can join the IICT and receive further benefits such as professional indemnity insurance, continuing professional education & discounts to events.  FREE life time access to list your Crystal Light Healing® Practitioner Workshops (should you choose to teach these workshops) on our websites Event Directory. Practitioner & Teacher VIP Member discounts for our online store. Accredited with full rights to TEACH the entire Crystal Light Healing® Practitioner face-to-face workshop (CLH Levels I, II & III) anywhere around the world. FREE signup as an Affiliate of our Crystal Light Healing® Practitioner eCourses. You can sell our Crystal Light Healing® Practitioner eCourse to your students / community and not only do they receive a special VIP discount from you, you also receive Affiliate LOVE money from us in return. Workbooks for Crystal Light Healing® Levels I, II & III (between 160 - 180 pages). Rights to download, print & distribute these to students at your Crystal Light Healing® Practitioner workshops. 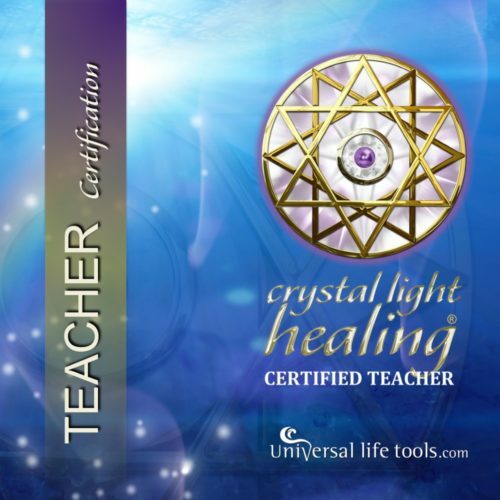 Certificates for Crystal Light Healing® Levels I, II & III plus large Crystal Light Healing® Practitioner Certificate. Rights to download, print & distribute these to students on completion of their Crystal Light Healing® workshops with you. Posters for Crystal Light Healing® (there are 5 large posters in total). Rights to download, print & distribute/sell these to students on completion of their Crystal Light Healing® workshops with you.  Powerpoints for Crystal Light Healing® Levels I, II & III. Rights to download & modify these for use in the facilitation of your Crystal Light Healing® Practitioner workshops. HUGE variety of Documents - Admin, Marketing tools, Graphics & Teacher Aids are available for download. These are designed to support your Promotion & facilitation of your Crystal Light Healing® Practitioner workshops (access to over 500 files/documents / videos). These resources are VERY comprehensive and our graduates are greatly appreciative of the energy, love & service we have put into supporting our Teachers. Even if you do not TEACH Crystal Light Healing®, the structure these support documents provide for your own business is leading edge. Continuing Professional Education Resources… such as Videos, Articles, Audios etc..
Free Lifetime Crystal Light Healing® Teacher Mentorship with Simone, to support you in teaching Crystal Light Healing®. Mentorship is available only to graduates who choose to teach Crystal Light Healing® Practitioner workshops. Inviting you to enrol today in our Crystal Light Healing® Life Mastery Teachers. Alternatively, if you require more info, send us a Message! Essence of Angels® is an empowering experience into the Divine Radiance of your Soul. The Radiant Light of your Soul comes into form through the 13 Angelic Sacred Templates of Creation, the breath of Great Spirit. Your Radiant Light beams your Soul Blueprint - a Sacred Map of your past life experiences, your divine gifts & Soul-full challenges in this life time and offers reverent insights into future potentialities. Experiencing a force of LOVE that breathes your Radiant Light into existence empowers you to transform dis-ease, let go of self-defeating thoughts, experience forgiveness, heal relationships & joyously surrender to an abundantly succulent life. Your Essence of Angels® studies with us are Graceful, Heartful & powerfully transformational teachings. PLUS the wisdom teachings are shared in a way that make them practical, grounded & luminscently fun! Inviting you to study Essence of Angels® Teacher Program with us and join our community of 1000's of graduates around Ancient Mamma Earth sharing their Angelic Healing wisdoms in many creative, innovative and fabulistic ways! 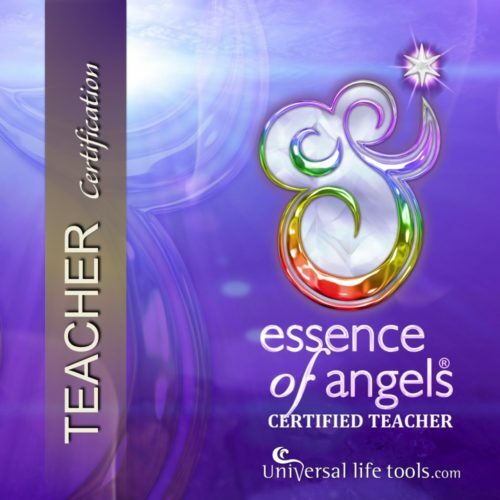 When you enrol in our Life Mastery Essence of Angels® Master Teacher Program, you receive instant access to our Essence of Angels® Master Teacher eCourse WEB PORTAL, such that you can start your online studies immediately! Please view our Essence of Angels® Practitioner eCourse page for full details. These 14x Essence of Angels® Sacred Ancient Template Essences are shipped to you FREE upon enrolment. Please view our Essence of Angels® Boxed Set page for full details. FREE life time access to list your Essence of Angels® Practitioner Workshops (should you choose to teach these workshops) on our websites Event Directory. Accredited with full rights to TEACH the entire Essence of Angels® Practitioner face-to-face workshop anywhere around the world. Workbooks for Essence of Angels® Practitioner workshop. Rights to download, print & distribute these to students at your Essence of Angels® Practitioner workshops. Certificates for Essence of Angels® Practitioner. Rights to download, print & distribute these to students on completion of their Essence of Angels® workshops with you. Posters for Essence of Angels® (there are 5 large posters in total). Rights to download, print & distribute/sell these to students during their Essence of Angels® workshops with you. Powerpoints for Essence of Angels® workshops. Rights to download & modify these for use in the facilitation of your Essence of Angels® Practitioner workshops. A HUGE variety of Documents - Admin, Marketing tools, Graphics & Teacher Aids are available for download. These are designed to support your Promotion & facilitation of your Essence of Angels® Practitioner workshops (access to over 500 files/documents / videos). These resources are VERY comprehensive and our graduates are greatly appreciative of the energy, love & service we have put into supporting our Teachers. Even if you do not TEACH Essence of Angels®, the structure these support documents provide for your own business is leading edge. Free Lifetime Essence of Angels® Teacher Mentorship with Simone, to support you in teaching Essence of Angels®. Mentorship is available only to graduates who choose to teach Essence of Angels® Practitioner workshops. Inviting you to enrol today in our Essence of Angels® Life Mastery Teachers. Aetheric Healing™ is the dynamic art of living your life in harmony with the symphony of universal intelligence - the Aetheric Field - expressing itself through you. Aetheric Healing™ isn’t just another tool, practice or modality that works with the Body/Mind/Spirit. Aetheric Healing™ is a divine synthesis of ancient wisdoms drawing from Ayurvedic Medicine, Yoga, Acupuncture, Pranic Healing, Qi Gong, Kinesiology and Quantum Healing - hence Aetheric Healing™ a way of life, a medium to express the beauty, magnificence and sacred purpose that is YOU. Inviting you to study Aetheric Healing™ Teachers Program with us and join our community of 1000's of graduates around Ancient Mamma Earth sharing their Healing wisdoms in many creative, innovative and fabulistic ways! When you enrol in our Life Mastery Aetheric Healing™ Teacher Program, you receive instant access to our Aetheric Healing™ Teacher eCourse WEB PORTAL, such that you can start your online studies immediately! Please view our Aetheric Healing™ Practitioner eCourse page for full details. 3. 4 x Personal Mentor Sessions with Simone. Aetheric Healing® is an Interationally Accredited Modality with the IICT (coming June 2018) hence upon being awarded your Certificates, you can join the IICT and receive further benefits such as professional indemnity insurance, continuing professional education & discounts to events.  FREE life time access to list your Aetheric Healing® Practitioner Workshops (should you choose to teach these workshops) on our websites Event Directory. Accredited with full rights to TEACH the entire Aetheric Healing® Practitioner face-to-face workshop anywhere around the world. FREE signup as an Affiliate of our Aetheric Healing® Practitioner eCourses. 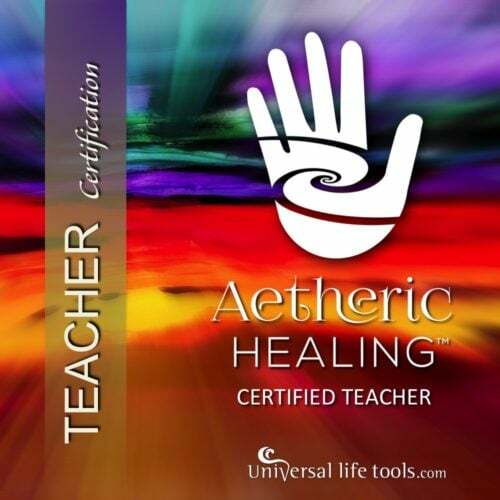 You can sell our Aetheric Healing® Practitioner eCourse to your students / community and not only do they receive a special VIP discount from you, you also receive Affiliate LOVE money from us in return. 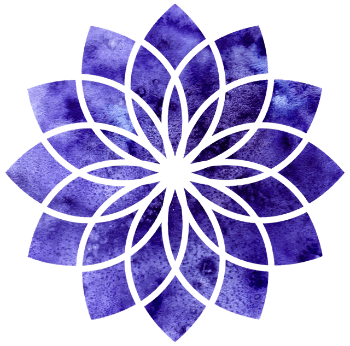 Templates for Aetheric Healing™ Practitioner workshop. Rights to download, print & distribute these to students at your Aetheric Healing™ Practitioner workshops. Certificates for Aetheric Healing™ Practitioner. Rights to download, print & distribute these to students on completion of their Aetheric Healing™ workshops with you. Posters for Aetheric Healing™ (1 large poster). Rights to download, print & distribute/sell these to students during their Aetheric Healing™ workshop with you. Powerpoints for Aetheric Healing™ workshops. Rights to download & modify these for use in the facilitation of your Aetheric Healing™ Practitioner workshops. A HUGE variety of Documents - Admin, Marketing tools, Graphics & Teacher Aids are available for download.  These are designed to support your Promotion & facilitation of your Aetheric Healing™ Practitioner workshops (access to over 500 files/documents / videos). These resources are VERY comprehensive and our graduates are greatly appreciative of the energy, love & service we have put into supporting our Teachers. Even if you do not TEACH Aetheric Healing™, the structure these support documents provide for your own business is leading edge. Free Lifetime Aetheric Healing™ Teacher Mentorship with Simone, to support you in teaching Aetheric Healing™. Mentorship is available only to graduates who choose to teach Aetheric Healing™ Practitioner workshops. Inviting you to enrol today in our Aetheric Healing™ Life Mastery Teachers. This body of work (Crystal Light Healing® & Essence of Angels®) is so far advanced of any other course out there. Where other folks have snippets; Simone has the whole picture. I believe her work has laid the foundation for Crystal Healing to become mainstream for all of us via the osmosis of consciousness. I have had crystal friends all my life and the gift of Simone's awareness transformed and deepened my own connections with them in ways I couldn't imagine and continue to do so everyday. No matter where you begin this course, if you know nothing at all or have a level of mastery, Simone's Crystal Light Healing® Teachers Course will take you to the next level. I have had the privilege of doing this course 3 times with Simone with 60 or so people from all over the world and everyone is always blown away by day 6! It is so deep, so profound and so thorough that you always discover something new, amazing and poignant. The best thing is that this body of work integrates with every other body of work you might have already encountered and then deepens it. You can take anything you are doing and shift this whole course in that direction to support your works growth and it will enhance, refine and amplify it because Crystal Light Healing® foundation is pure. If you are a healer or want to be a healer... heck, if you just love crystals and are curious about their 'mystical' powers - study with Simone, she lives her work and her purpose - awakening the hearts of all she encounters. I guarantee that you will not be disappointed. As we are from such faraway places- I am from Romania and Simone is from Australia, the first miracle that I consider in relation with her work was meeting her personally, in UK, during the Spirited-Travelers World Tour. There I attended the Essence of Angels® Practitioners course and a whole bunch of miracles started to unfold in my life. My whole energy has changed, as I took Azrael as a guide at the end of the course. I became an Essence of Angels® Teacher and began to spread the knowledge channeled through Simone. I was impressed with the blend of authority, intelligence and intuition revealing from such a sweet woman.I was honored to spend time with her and learn things from her during one-to-one teaching. Drawing upon the Essence of Angels® teachings, I adjusted my Astrology background with the Archangels and Chakras system and could expand my understanding and my explanations upon astrological charts and events. In this way, I could better use Astrology for the personal growth and spiritual evolution of each client. The most important thing that happened after absorbing Simone teachings was that I changed myself, as a human being in relation with other human beings. There is long way to the total attunement, but I consciously started to choose a life based on the fact that "We are all one". My experience with Simone was nothing short of a miracle. Simone's course "Essence of Angels" has brought me so much joy and a deeper understanding of the Essences of Angels and the spiritual laws, that govern our universe. Her guidance and meditations have profoundly shaped how I interact with my own personal essence and the gift of who I am. Simone's Angel Essences are a true gift to humankind and very helpful for personal development, support of life challenges, as well as for physical, emotional and mental healing. I am eternally grateful for Simone having taken it upon herself to travel around the world to share her gift, insights, and healing. Being in Simone's presence is a true gift. Simone is one of our great spiritual teachers committed to bringing expansion in our consciousness allowing us to see our true selves and free us to create something better for ourselves and others. Her teachings are profound and her heart essence and dedication are inspiring. When I met Simone, I was teaching others to open up to crystals, Reiki and their intuition. In my crystal courses I felt there was a missing key I just wasn’t able to access, that key was within her teaching, I enrolled and took the teacher training the following year, becoming Simone’s first CLH teacher in 2008. What a beautiful journey of growth and expansion, fully supported by Simone in a heart centred and generous way this has been. I have loved and worked with crystals and gems for a very long time as a practitioner and educator. In 1995 I introduced naturopaths and massage students at a college in Melbourne, to the the world of vibrational medicines such as crystals and sound. I was constantly considering writing a course and sharing my knowledge of crystals, but life got in the way. I was already developing curriculum and Diploma courses in Aromatherapy by 2005, but the mineral kingdom kept alluding me. Which was crazy, since they were the first of nature’s gifts to knock on my door. Then I came across Simone’s Universal Life School, whilst searching the web for schools offering crystal courses. Took the plunge and enrolled in all courses and the Life Mastery Teacher course Crystal Light Healing®. I thought, why write a course, when someone like Simone has done all the work. And it was brilliant and More than I had hoped for. I came away feeling more confident to share mine and Simone’s knowledge. Especially the sacred geometry, which was the missing link for me. Forever grateful to Simone for her generous spirit and very pleased to be associated with her school and the work. Crystal blessings, Mathlini-Rosze Cernigoi at Aroma Harmonics. Inviting you to Enrol in our our Life Mastery Programs. I live outside of Australia, can I still enrol ? Our UniversalLifeTools.com Wisdom School is an International School with Practitioner & Teacher Graduates around the world. We welcome participants from ANYWHERE in the world to enrol in our eCourses. All of courses are Internationally Accredited and certified by the IICT (International Institute of Complimentary Therapists) in over 26 Countries. I haven't studied any Healer/Practitioner Courses before, can I still enrol ? Our Life Mastery Teacher Courses are open to EVERYONE, whether you are a novice or have decades of teaching/healing experience. When you enrol in one of our Life Mastery Teacher Courses, your Teacher Web Portal includes access to the respective Healer/Practitioner Courses... therefore there is NO Pre-requisites for your enrolment. Please visit our Payment Plan Application Page for details. Upon approval, we will send you an Invoice detailing your Payment Plan. Please note: Access to the Teachers eCourse will NOT be granted until your Payment Plan is finalised in FULL. Is the enroment fee a one-off investment fee ? Once you have paid your upfront Life Mastery Course fee, there are NO additional costs payable after payment of your course investment. That means there are no annual membership fees or moneys to remit to our Wisdom School upon facilitation of your workshops - any revenue you earn is your own. Is there a timelimit for completion of any course ? When you enrol in any of our Life Mastery Teacher Courses, you have a lifetime of access to the course. You complete the course on-line, in your own time and at your own pace. Whether you complete the course in 6 months or years to come… it is completely up to you ! When can I start studying my Life Mastery eCourses ? When you enrol in any of our Life Mastery Courses, you receive instant access upon receipt of your payment. Do I have to buy products to facilitate workshops ? As a Life Mastery Teacher in any one of our modalities, you learn how to use many of our Wisdoms Schools Vibrational Products… but NONE of these products are compulsory. Thus as a Teacher there is no need to purchase any products through our eShop. The only exception to this rule relates to our Essence of Angels® Teachers - as they must make available the use of the 14 Vibrational Essences for experiential exercises during their Face-to-Face Essence of Angels® Practitioner Workshops. It only stands to reason that student practitioners must be proficient in the use of the Essences. To purchase products through our online store, all Teachers are gifted our VIP Teacher Coupon Code to receive 25% off. Do I HAVE to Teach upon graduation as a Life Mastery Teacher ? Whilst you graduate as an Internationally Accredited Teacher through our Wisdom School, there is no obligation to teach any of our workshops AND in fact MANY students complete our Life Mastery Heart Retreat Programs purely for the joy of learning, mindful living, and connecting with a deep sense of inner-peace & sacred purpose. When can I start teaching ? Once you have completed ALL Components of the Life Mastery Course you are enrolled in, you then formally graduate with a Certificate of Metaphysical Healing – Master Teacher. You must wait a minimum of 3 months from purchase date until you are eligible to graduate. Upon graduation, you are then given access to your relevant Life Mastery Online Teacher Resources Pack, and can commence facilitating face-to-face Workshops straight away, anywhere in the world. I have previously enrolled in a Practitioner eCourse(s), can I upgrade to the Teachers Course ? Do I get a discount for what I have already paid ? If you have previously enrolled & paid in any of our other Practitioner eCourses (Crystal Light Healing® or Essence of Angels® or Aetheric Healing™), then you are eligible to receive a partial discount for the amount(s) you have paid. Please email our office with the details of your original purchase (your original eShop Order #/s or your Invoice #/s if you were on a payment plan) and we will email you a discount code for use during checkout through our eShop. If you purchased the Essence of Angels® Practitioner eCourse SPECIAL PACKAGE (which included the 14 Essences), then you can claim a partial discount for the price you paid on this SPECIAL PACKAGE, however a second set of these 14 Essences will not be shipped as part of your Heart Retreat enrolment (regarding enrolments in our Life Mastery Essence of Angels® Teachers Course). I have previously attended face-to-face workshop/s ? Can I get a discount for what I have already paid ? The Practitioner eCourses (Essence of Angels®, Crystal Light Healing® & Aetheric Healing™) are COMPULSORY components of their respective Teacher Courses - hence NO recognition for prior learning or discounts are available for attendance at previous face-to-face workshops. This also includes any other studies you may have completed through Universal Life Tools, such as our Wisdom eCourses, Shealla-Dreaming or Soul Evolution eCourses. As a graduate Teacher, am I able to SELL the respective Practitioner eCourse/s ? As a graduate Teacher, you are able to facilitate your own face-to-face Practitioner Workshops in your respective modality. You ALSO are given AFFILIATE access (if you wish to take us this option) to sell the respective Practitioner eCourse/s. You can sell our Practitioner eCourse/s to your students / community and not only do they receive a special VIP discount from you, you also receive Affiliate LOVE money from us in return. Is my Profile & Event listing Free on the Universal Life Tools website? As a Certified Life Mastery Teacher through our school you receive a FREE Lifetime Listing on our Practitioner & Teacher Directory PLUS you can advertise your Workshops on our Event Schedule for FREE. When I advertise my Practitioner Workshops, are there set prices for these workshops ? Our Universal Life Tools community of Teachers, is a community of people that support the values of kindness & caring for one another. Our School, our community of Teachers is not about competition, but rather is about abundance and support for all. To uphold this support in our global marketplace, our school has a Scheduled ‘Price List’ of Workshops by country – ie the price that each Practitioner Workshop can be advertised for. The reason for this is, if anyone googled the cost of a Practitioner workshop in say the USA, they would find the SAME on-line price in USD everywhere on the net. In saying all of this, Teachers are most welcome to offer their workshops at reduced cost (eg if you run them from home or as a hobby and not your core business then your overheads are dramatically reduced)… but rather than advertising the reduced $ sale price, you would advertise that Coupon Codes / Discounts are available to our community members just sign up to our email list etc. This then becomes a great individual marketing tool for Teachers and can be used to your benefit. The Scheduled List Price of each workshops is the same price as advertised in our online shop. When I facilitate my Practitioner Workshops, does each workshop level have to be facilitated over 2 days ? When facilitating your Practitioner workshops, each individual level must be facilitated over a MINIMUM of 15 contact hours (this is a requirement regarding our accreditation with the IICT). However, how you facilitate the 15 contact hours per Level is up to you… for example, you could run the course over many face-to-face evenings… say 2.5 hours over 6 weeks. This will be discussed in more depth during your mentor sessions with Simone - helping you to find the right format for you. Please also note, there are no MAXIMUM number of hours you can facilitate each Practitioner Workshop level… hence many Teachers enjoy teaching some or all of the levels as a Retreat. If in Retreat Format, you may need to charge more to cover food, accommodation, travel etc… this would be in addition to the Scheduled Workshop Fee by Country/Currency. This will be discussed in more depth during your mentor sessions with Simone - helping you to find the right format for you. During my Teacher eCourse Studies, when can I have my personal mentor sessions with Simone ? When you commence your Teacher eCourse studies, you are welcome to have your personal mentor sessions at any time. You can choose to allocate time at the commencement of your course, during your course or at the end of your course. If you live interstate or overseas, then these personal sessions can be facilitated via Zoom or if you live near or are visiting the Sunshine Coast (Qld, Australia) then you could schedule a face-to-face meeting with Simone.